Stamps.com is a great extension that leverages the stamps.com API for full integration for purchasing and printing postage and labels for shipping. Now you can pay for postage, create real shipping labels from carriers, and prepay for those labels so packaging is easy and streamlined. First, you must install all EasyCart extensions as new plugins. This is a very easy task with WordPress and we have a short guide here to get you started. Click Here to learn how to install a WordPress plugin and EasyCart Premium extensions. 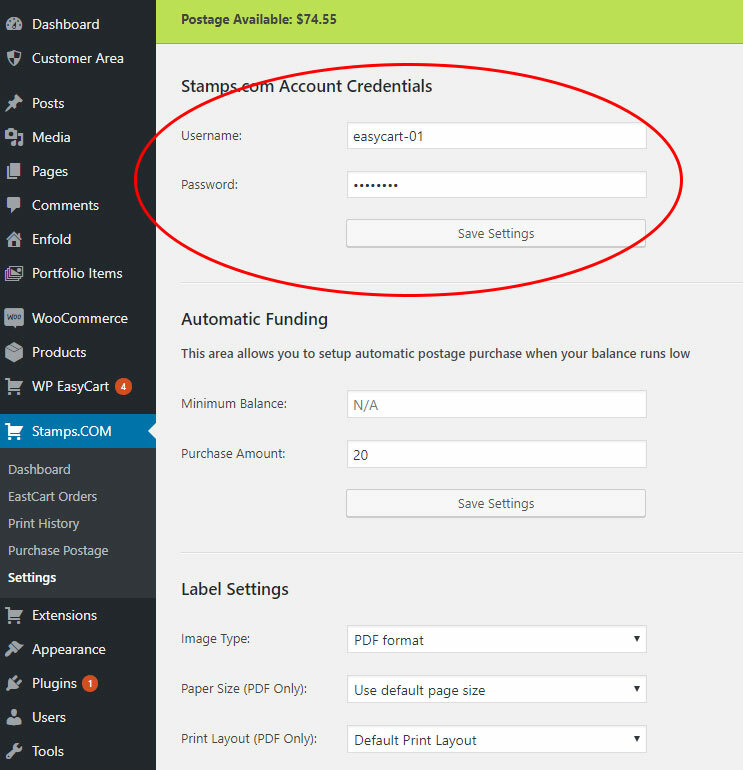 First, you will need to have a stamps.com account and install the easycart stamps.com extension. You will see the new menu on the side of your WordPress to allow you to administrate the system. 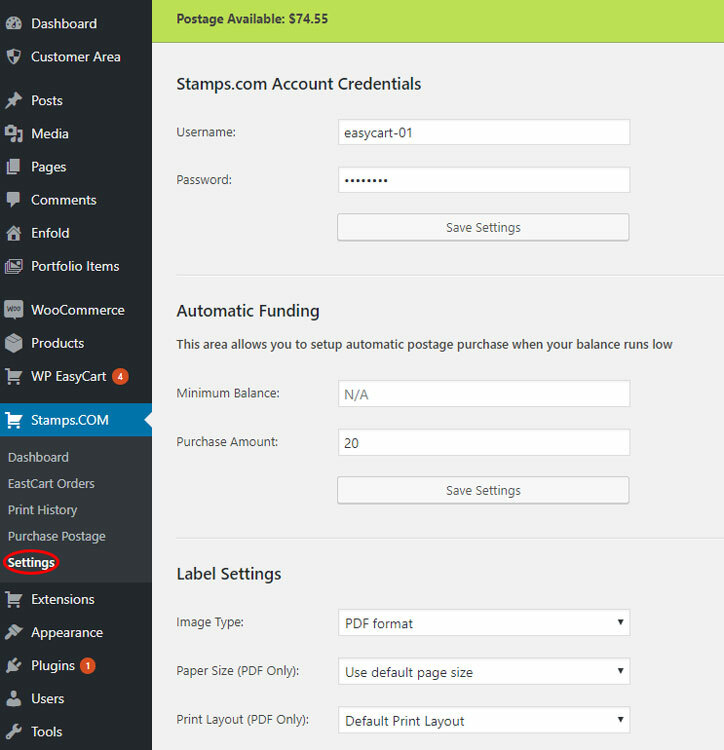 The first step is to connect to stamps.com by clicking on the settings menu. From here, you will want to enter your stamps.com account credentials for the API access. You will also want to scroll down and enter your ‘Ship From’ address to calculate shipping. Now that you have Stamps.com setup and configured, you will want to start processing labels. First, you can buy postage by visiting the Purchase Postage menu. Once on this screen, you can purchase and keep postage account filled so that you can continue purchasing from your account. We display how much your account has near the top for your convenience. Now that you have connected to Stamps.com and purchased postage, you can begin printing and generating labels for orders. 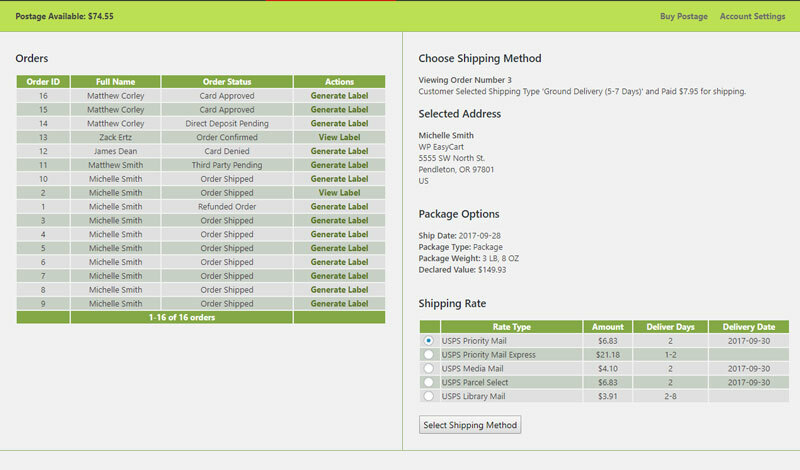 Simply click on the EasyCart Orders menu button to view the current orders. Once you see a list of orders, names and their order status’s, you can start the label generation process by clicking ‘Generate Label’. If you have past labels already generated, you can simply ‘View Label’. 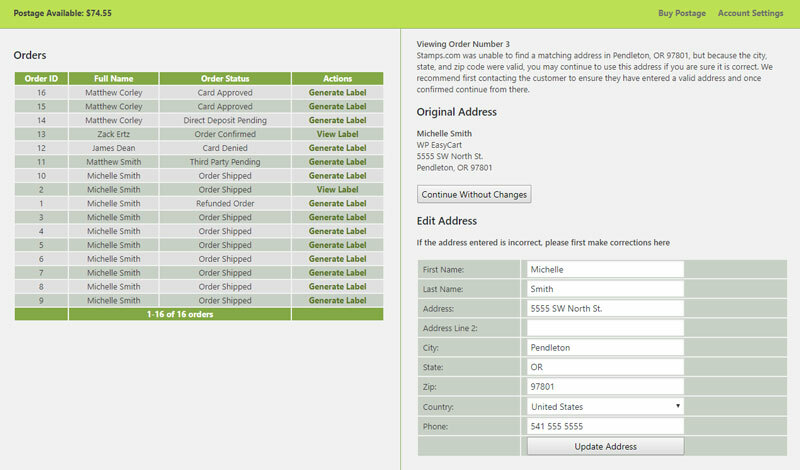 With an order selected, you will first choose to accept the address the user has entered. You can manually update that address if you need to as well. 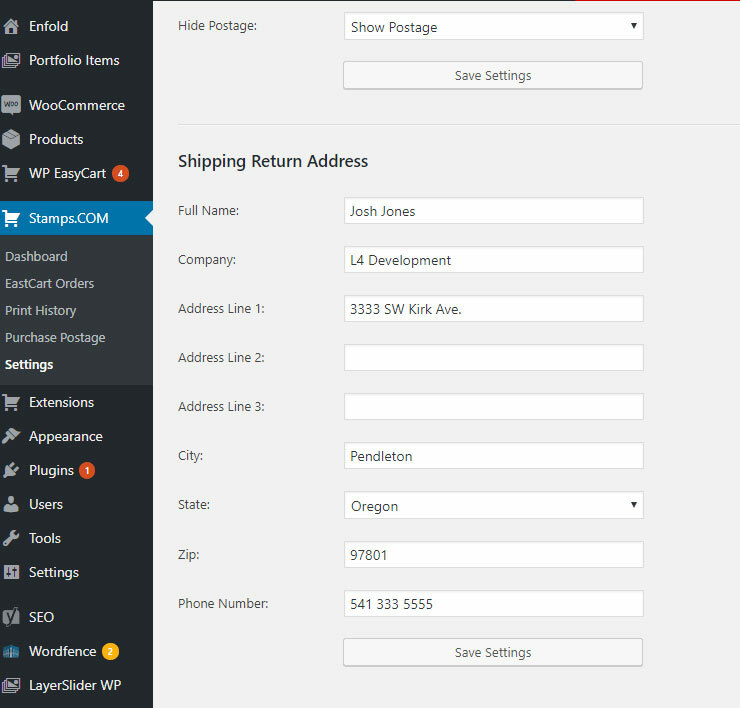 Once you have the address set, you can setup the package type. There is a variety of package types to choose from as well as weight and dimensional units to send to Stamps.com to get accurate shipping costs. Now you can select shipping methods returned by Stamps.com. 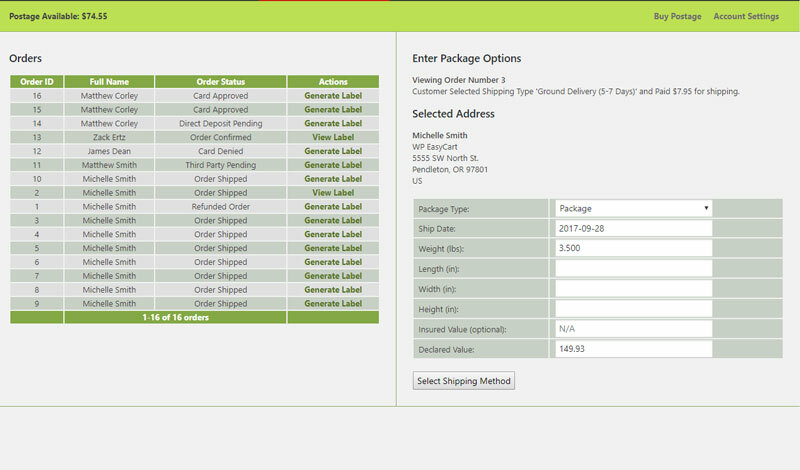 We also provide the cost that the customer paid and their selected shipping method at the top of this screen. This will insure you are choosing a shipping option that is as accurate as possible to the customers selected rate and method. 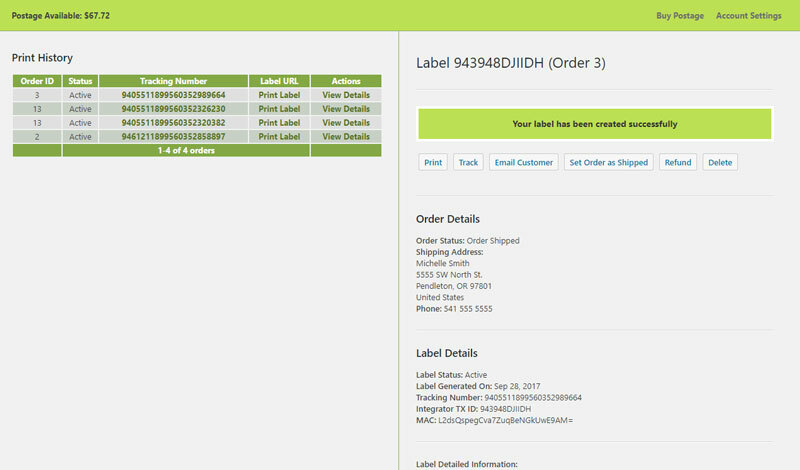 Once you select a shipping method, you will be present with a variety of choices to print the label, track, email the customer, set the order as shipped, or refund/delete. You can also review a label at a later time by going to the ‘Print Label’ either from the dashboard or order history section.